So to celebrate, this week I bring you mythic, fairy tale and fantastical poetry from around the web. I should start by saying that I always feel horribly self-conscious when writing about poetry (which is silly, I know, and this whole idea that poetry has a special status and is above the reach of mere mortals is part of the reason why so many people don't really read it anymore, and that's a pity, but I just can't help myself), so apologies if this is short and awkward. Which it will be. But at least I'll link to the poems, so you can read them yourself. For when he sleeps he does so with charm, a tidy hump upon his ordained pillow, else loose-boned and sprawled upon the forbidden couch. If you're an animal lover, read it. If you're not, read it anyway. "Why do you write such long poems?" "Donkeyskin" by Midori Snyder is based on the fairy tale of the same title, and like the fairy tale, it's raw and painful and beautiful. I cannot pick a favourite line, so I'll just urge you to read the whole thing. 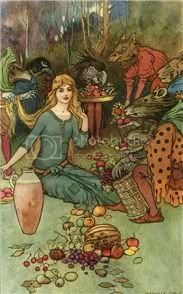 Finally, Goblin Fruit inspired me to re-read what is perhaps the greatest fantastical poem of them all: "Goblin Market" by Christina Rossetti. I love it. I love the playfulness of the language, I love the sensuousness, I love how deep down it's serious and dark. I love the rhythm, the imagery, and the way it defies gender roles. I love how daring it was for its time. And I love this audio version, which really makes the language come to life. Also, when looking for Arthur Rackman's illustrations of "Goblin Market", I came across this illusrated version by John Bolton. Wow. Simply wow. Time to announce the winners of my blogging anniversary giveaway: Memory wins a book of her choice that I have posted about in the past two years. Memory is currently fighting an epic battle with her TBR pile, so I almost feel bad to be adding to it, but...free book! Those are welcome, right? As for the Mysterious Awesome Package, it goes to Kailana! Congratulations to you both. I'll get in touch with you via e-mail for the details. And now for something completely awesome: Renay is organizing a YA Book tournament for less well-known books. This is the perfect way to discover great YA books we probably have never heard of before. To go through with it, Renay needs help: people willing to suggest books, to be judges, to help with organizational tasks, or to just spread the word. Interested in helping? Just click the link for details. I'm not a poetry person myself, but my husband is, and he loves Goblin Market. I'll have to take you guys' word for it. That is a fantastic poster! This is supposed to be a work, work, work weekend for me (shhhh...I'm not really here), but I fully intend to go read each one of those poems later this week. I've never read Goblin Market, but I adore Christina Rossetti, and with a recommendation from you, I'm absolutely positive that I'm in for a treat! You've really made me want to go read Annie's Starwalkers again too...but that's just a mom thing. :) Thank you for the lovely post and all the links! I really struggle with poetry - I don't know why I just can't get into it. Though what I read was beautiful. I see your reading The Tygrine Cat now - hope you are enjoying it. I write poetry on my other blog,rooted almost daily. I interact with various networks, poetry networks, that is. And always on a look out for poetry books, and new poets. I post reviews of those books on both my blogs. I love Atwood's poetry. I like what you post here. I will check out all of those. 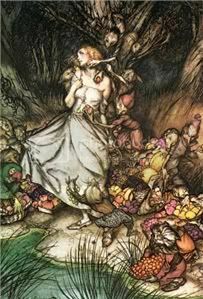 I love Goblin Market -- thanks for linking to that great illustrated version! And interesting to see that Kij Johnson has written a dog version of Christopher Smart's poem Jubilate Agno (or, My Cat Jeoffrey). Amanda: One of the best things about Gobin Market is that it tells a story. You could give the audio version a try sometime! Debi: Thanks for visiting despite being busy :D Oh, you will love Goblin Market for sure. I recommend the multimedia experience: have the text in front of it, listen to it, and feast your eyes on the gorgeous illustrations :D And not just a mom thing...Starwalkers is a wonderful poem! Kailana: Indeed you do :D Congrats again! Scrap Girl: I'm really enjoying it so far! Guatami: That's great that you write poetry yourself. I should read more of Atwood's poetry, because I really love what I've read so far. Melanie: Thank you so much for the link! I had totally missed the reference. Oh, fabulous post, Nymeth! I love it! I've used your links to go read the poems, and I like the illustrated version very much. Thank you for making poetry fun and accessible - as you say, it's difficult to erase the idea that poetry is only for the elite, when it's written for everyone, anyone, to enjoy, and relate to. I like Jane Yolen's poetry, and I love combining poetry and fairy tales! Fabulous! I agree with Claire--Carroll's poems are a lot of fun, and I love his word play in everything he's done. I'm really bad about reading poetry. I have several volumes on my shelf, but I rarely pick them up. Love Goblin Market, though! Thanks for all the great links! I love "Once Upon a Time". What a great poem. Yolen nevr ceases to amaze me. Thanks for the link to Goblin Market. It's actually my assigned reading for this weekend from my professor. "For when he sleeps he does so with charm, a tidy hump upon his ordained pillow, else loose-boned and sprawled upon the forbidden couch." I love that! "A tidy hump"--wonderful! Thank you for all of the great links. Poetry is very intimidating to me, but I read a few of the poems you mentioned and even enjoyed them. Then I had to look up the tale of the Girl With No Hands. I'll say this for the Grim Brothers, their stories were certainly a lot more dark than the Disney tales I grew up with! Wow, Nymeth. What can I say. You've done a brilliant job here. "...all the world's magic comes directly from the mouth." You've inspired me to read some poetry! I have a couple of books in mind. 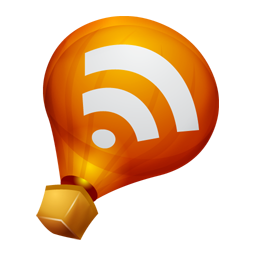 Thanks for a fantastic post and the links!! Thanks for the lovely post, Nymeth! I have to admit I'm not a poetry person but some of them are just so meaningful and beautiful! I guess I also must have the right mood to read them, hehe. I have to be in the right frame of mind for reading poetry. I'll come back to your post Nymeth, one first glance, the poems look like somethign I would enjoy. Susan: Thank you, my friend :D Those illustrations are stunning, aren't they? I wish I could find that edition to buy, but sadly I can find no info about it. And yes, Jane Yolen's poetry, as her prose, is wonderful. That notion of poetry is indeed hard to get rid of, but I try to make an effort, and it's worth it. Literary Feline: It's such a nice poem :D I hope you have a great week yourself! Claire: Yes! I love Carroll! He's so much fun. Trish: I forgot about him, but I definitely agree. I tend to ignore my poetry books as well. But when I devote time to them, I find it so rewarding. Chris: That's too bad that Atlas is taking so long :( I got it via BookDepository and it only took about a week or so. But you'll see...it will be worth the wait. Staci, I look forward to hearing about what you read! Miss D: You can help but by being a judge, which involves committing to reading a least two books, or simply by suggesting titles for the judges to read, which is less time consuming. Melody: Yes, my reading mood definitely helps me appreciate poetry more. Most important of all, I can't be in a rush. Violet: Not cheesy! cummings is one of my absolute favourites. I love love love his stuff. I will definitely check out the poems you listed. The ones by Atwood and Yolen particularly got my interest. I also need to check out the YA Tournament, thanks for sharing. "whole idea that poetry has a special status and is above the reach of mere mortals is part of the reason why so many people don't really read it anymore"
This is a statement that I think a number of poets and readers of poetry will disagree with. I, for one, do not believe poetry is above mere mortals. I think there is some poetry that appeals to certain readers more than others. I really do try to bring more poetry to my readers and I hope that this will help dispel this myth that poetry is above mere mortals. I hope that I can show people that is more than that...that it can appeal to everyone. I really enjoyed those poems that you posted and I love the imagery in them as well. Thanks for participating even if it is not National Poetry Month where you are. Ha, I just got that the poster is an allusion to Eliot's "The Love Song of J. Alfred Prufrock." Gold! Rhinoa: It'd be awesome if you could join! Serena: You're absolutely right, of course. 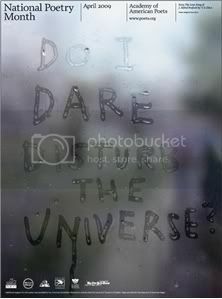 Which is why I said it's a silly idea :) It's just so hard not to let it intimidate me sometimes! great post, thanks for sharing the poetry. I also love that poster! I'm excited to immerse myself in poetry (at least a little bit) this month. Nymeth... there is so much contained within this post, I'm bookmarking it for further perusal. Excellent links on some of my favorite subjects (myths & fairy tales). Thank you! Nymeth, these are great. I love the line you quoted from "For I will Consider My Dog, Bertie." I prefer the first line of "'Once Upon A Time,' She Said" although I think I like it for much the same reason you like the last. and the world began anew:"
of elegiac examinations of folklore. What creepy/beautiful imagery in the "Goblin Market!" Thanks for putting all these together for us! Rebecca: It's such a great poster! I'll definitely make an effort to immerse myself in poetry this month. I tend to forget how much I actually like it. My daughters' school does this fun thing for poetry month called "a poem in your pocket." Everyone gets a little poem to fold up and keep in their pocket, even the teachers and the principal. All day they can ask to hear each other's poems. By the time they got home, they had them memorized!